By Niamh Foran | February 27, 2013. Anthony Daly’s Dublin opened their 2013 league campaign with a 1-20 to 2-16 win over Offaly, in Parnell Park on Saturday night. The capital’s hurlers have had mixed luck in their league campaigns since Daly took over at the helm in 2008, reaching their peak with a league title in 2011. 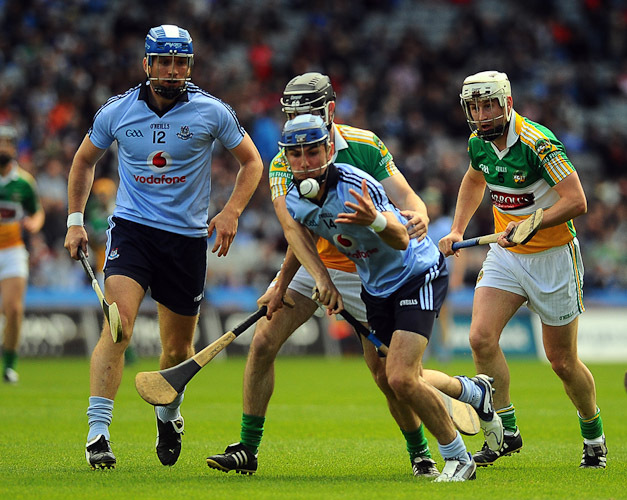 However, the Dubs were relegated from the top flight in 2012 and begin their 2013 season in division 1B. Fresh from their Walsh Cup victory earlier this month, Dublin came out of the blocks running against Offaly on Saturday night. Six points came from the on-form Paul Ryan, leaving the Dubs leading by 13 points to 0-6 early in the second half. Offaly’s Shane Dooley showed his worth with an impressive 2-9 tally for the night. Dooley’s two goals came in the second half to narrow the seven point gap Dublin had opened up from early on. The major worry Anthony Daly and his backroom team will have after this league opener is the way in which his team let a significant early lead slip, to finally win the game by just one point. The second of Shane Dooley’s two goals came from a 21-yard free in the 61st minute, that had Dublin under pressure from Ollie Baker’s side for the first time in the match. The returning Conal Keaney rounded off the capital’s scorecard with the last of his five points in the 66th minute to give them the little bit of breathing space they needed to see the game out. Dooley pointed the final free to leave the final score-line 1-20 to 2-16, an opening win for Dublin that may be crucial in their bid for promotion this year.